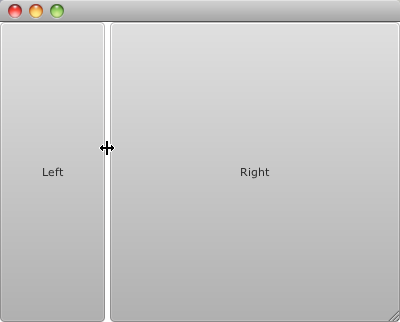 We have not yet provided a SplitView Control in JavaFX (and it is not in the plan for 1.3). However, the main reason is that it is relatively simple to write one from scratch so we’re focusing on some of the harder things (like TreeViews). I was asked recently how to go about writing a SplitView in JavaFX, so I decided to write a very short blog post with sample code from a demo I wrote for this past Devoxx. Cool i didn’t know about the container. it says:Base class for container nodes. A container is a resizable javafx.scene.Group whose width and height variables may be set explicitly. Richard: Can you please post a picture so we can see how it looks like? Sure, here’s a picture. In this case I chose to have the divider not draw anything, but using this technique you can draw it however you want. The left and right nodes here are Buttons. This shows how easy it is to implement custom ui components in javafx. How about an example of how this is used? Complete source code that produced that picture?